Blue Jeans staining my seats! Thread: Blue Jeans staining my seats! I had reservations about buying my 2015 Passat TDI SEL with the cornsilk interior but that's what my wife wanted. Anyways, the car doesn't even have 4,000 miles on it yet and the driver's seat is turning blue from blue jeans. The passenger seat has a blue tinge to it too but the driver's seat is definitely the worst. The blue is on the leather and the suede. I stopped by the VW dealer since it's only a mile from my house and they seemed aware of the problem but unsure as to the best way to clean it. Any ideas? I don't want to damage my seats. Has anybody else had this problem? Try Resolve carpet cleaner, but test a spot first. It works great, but it can also discolor certain fabrics and if it doesn't mix with the car seats, they could end up looking worse. Last edited by VAGguy; 01-14-2016 at 07:46 PM. 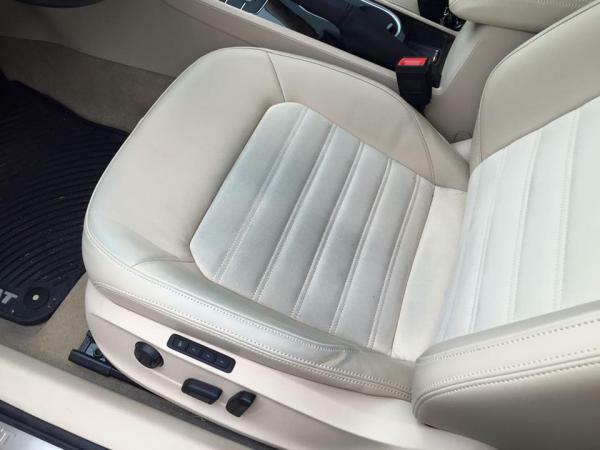 I use Griot's garage interior cleaner for most leather and interior cleaning and it works very well. Another option that lots of people use is Woolite diluted 10 to 1. Neither of the above will leave a residue to attract and hold dirt and grime. These guys make specific cleaners for blue jean dye removal if one of the first two doesn't work. I guess it goes without saying, but I will, after you get things cleaned up apply a good protectant to make future cleaning easier. I love this stuff and have been out for a couple years. I need to order a new bottle. Thanks for the reminder. I would use Megs APC and tornador or foam blaster to clean and remove the stain. Just be careful in agitating the fabric. Did you ever get this sorted? I am having the same issue with mine.